The Obama administration has awarded $270,000 to an Islamic charity that has been outlawed by some governments for its support of the terror group Hamas and other jihadist organizations, according to grant documents. The Department of Health and Human Services has provided a $270,000 grant to Islamic Relief Worldwide, a charity that has repeatedly been linked to terrorism financing and support for Hamas and the Muslim Brotherhood, according to recent grant information. The grant was awarded as part of a larger project to provide health services in Nairobi, Kenya, through the Centers for Disease Control and Prevention, according to the grant. Some terrorism experts have expressed concern that the administration is providing funds to Islamic Relief given its past ties to the Muslim Brotherhood and Hamas, ties that have led some governments to outlaw the charity. The United Arab Emirates and Israel both banned the charity in 2014 after investigations revealed that Islamic Relief had ties to Hamas, the Muslim Brotherhood, and other entities engaged in terror financing, according to reports. An investigation by the Israeli government led to accusations that the charity was providing material support to Hamas and its operatives. The charity "provides support and assistance to Hamas’s infrastructure," Israel’s Ministry of Foreign Affairs determined in 2006. 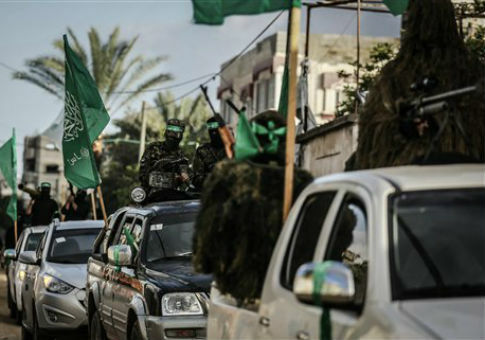 "The IRW’s activities in Judea, Samaria, and the Gaza Strip are carried out by social welfare organizations controlled and staffed by Hamas operatives." The charity further "appears to be a hub for donations from charities accused of links to al Qaeda and other terror groups," according to an investigation conducted by the Gatestone Institute. The charity’s "accounts show that it has partnered with a number of organizations linked to terrorism and that some of charity’s trustees are personally affiliated with extreme Islamist groups that have connections to terror," according to the investigation, authored by terrorism analyst Samuel Westrop. An audit of the organization’s accounts showed that it had donated thousands of dollars to a charity established by a terrorist affiliated with al Qaeda, according to Westrop. Israeli authorities arrested the charity’s Gaza coordinator, Ayaz Ali, in 2006 due to his alleged work on Hamas’s behalf. "Incriminating files were found on Ali’s computer, including documents that attested to the organization’s ties with illegal Hamas funds abroad (in the UK and in Saudi Arabia) and in Nablus," Israel’s foreign affairs ministry said at the time. "Also found were photographs of swastikas superimposed on IDF symbols, of senior Nazi German officials, of Osama Bin Laden, and Abu Musab al-Zarqawi, as well as many photographs of Hamas military activities." The charity attempted to mend its image in 2014 by performing an internal audit. However, experts criticized the effort as unreliable. "The information provided by [Islamic Relief] on its internal investigation is insufficient to assess the veracity of its claims," the watchdog organization NGO Monitor wrote in a 2015 analysis. "NGO Monitor recommends that a fully independent, transparent, and comprehensive audit of IRW’s international activities and funding mechanisms be undertaken immediately." Patrick Poole, a reporter and counter-terrorism analyst for Unconstrained Analytics, noted that USAID, a taxpayer funded organization, also has donated funds to Islamic Relief. "Time and again we see federal agencies and departments using taxpayer money to support the enemies of the United States and our allies," Poole said. "USAID is a persistent culprit in this regard. In 2005 it took an act of Congress, led by the late Rep. Tom Lantos [D., Calif.], to stop USAID from funding Hamas institutions in Gaza. Now we see them doing the same thing, but only using a middleman." The Department of Health and Human Services did not respond to a request for comment on the grant. This entry was posted in Issues and tagged Hamas, Obama Administration. Bookmark the permalink.